Aim To study the prediction of prognosis after hematopoietic stem cell transplantation (HSCT) by clinically available biomarkers prior to transplantation (CRP, Ferritin, albumin and platelet count). Background Previous studies have shown that a number of objective laboratory “biomarkers” are of interest in pre-HSCT risk-assessment: Serum albumin inversely correlates with age, smoking, obesity and hypertension, and predicts cardiovascular mortality. Serum ferritin is an acute phase reactant, and elevated levels suggest iron overload, which has been linked to post-HSCT infections. Finally low platelet count, could indicate poor marrow function related to persistent malignancy or effects of prior treatment. Methods The study included patients admitted at the Bone marrow transplantation Units in Egypt (Ain Shams University Hospitals and Maadi Armed Forces Medical Compound and Sheikh Zayed Specialized Hospital) between August 2015 and December 2016. The study population consisted of 30 adults aged from 18 to 60 years; 26 patients were subjected to autologous-HSCT to treat high-risk or relapsing NHL, MM, relapsing HL, and 4 patients subjected to allogeneic-HSCT to treat 1st complete remissiom (CR) AML, 2nd CR AML. The biomarkers included pre-transplant serum albumin, platelet count, C-reactive protein (CRP) and serum ferritin were centrally quantified by (ELISA) technique. All patients were followed up till day +90 post transplant. Results Shock developed post-transplant in patients with CRP ˃10 mg/L (P=0.026) while non-relapse mortality was associated with the pre-specified thresholds of platelet count <150,000/μl (P=0.046) but not CRP ˃10 mg/L (P=0.1) and s.albumin <3.5 g/dL (P=0.3) and s.ferritin <2500 ng/mL. (P=0.9). Three months overall survival (OS) was 87% among the studied group. Mean survival time was associated with low platelet count <150,000/μl (P=0.024) not with CRP ˃10 mg/L (P=0.1) and s.albumin <3.5 g/dL (P=0.6) and s.ferritin <2500 ng/mL (P=0.9). Conclusion We conclude that elevated level of pre-transplant CRP, s.ferritin associated with high NRM without statistically significant difference while NRM was higher in patients with normal s.albumin pre-transplant without statistically significant difference, low platelet count <150,000/μl associated with increased NRM with statistically significant difference (P=0.046), and lower survival the 3 months overall survival (OS) among patients was about 87%. Mean survival time was statistically significant in patients with low platelet count (P=0.024) not in CRP, ferritin and albumin. The study of the pretransplant prognostic factors is gaining interest by researchers in the field of hematopoietic stem cell transplantation (HSCT), to decrease the post-transplantation risks. Vaughn et al. added these objective laboratory biomarkers to refine the discriminative power of the hematopoietic stem cell transplant comorbidity index (HSCT-CI) for transplant outcomes. Previous studies have shown that a number of objective laboratory ‘biomarkers’ are of interest in pre-HSCT risk assessment: serum albumin inversely correlates with age, smoking, obesity, and hypertension; serves as a marker of inflammatory status; and predicts cardiovascular mortality. Serum ferritin is an acute-phase reactant, and elevated levels suggest iron overload, which has been linked to post-HSCT infections and hepatic and pulmonary complications. Finally, cytopenias, as represented by absolute neutrophil count, hemoglobin, or platelet count, could indicate poor marrow function related to persistent malignancy or effects of prior treatment . Previous analyses correlated pretransplant C-reactive protein (CRP) levels with overall survival (OS) and transplant-related mortality (TRM). However, various combinations of markers were studied in different hematological diseases, with inconsistent results . The aim of the study was to measure pretransplant-specific objective laboratory biomarkers, namely, CRP, ferritin, albumin, and platelet count, in the serum of patients with hematological malignancies, as prognostic factors in the early outcome of HSCT, to evaluate the relation of their abnormalities to the disease and chemotherapy that the patients received before transplantation. This will improve our ability to anticipate their potential value as predictive markers for prognosis in patients and as pretransplant targets to improve the risk stratification of patients. The study, after a written informed consent for all patients, included 30 patients prospectively studied, who were subjected to HSCT for treatment of hematological malignancies in the Bone Marrow Transplantation Units of three different Hematological Centers, Ain Shams University Hospitals, Maadi Armed Forces Medical Compound, and Sheikh Zayed Specialized Hospital, between August 2015 and December 2016. Patients were followed up for 90 days after transplantation. A total of 26 patients underwent autologous-HSCT to treat high-risk or relapsing non-Hodgkin’s lymphoma (NHL), multiple myeloma (MM), and relapsing Hodgkin’s lymphoma, and four patients underwent allogeneic-HSCT to treat first complete remissiom (CR) acute myeloid leukemia (AML) and second CR AML. Patients with hematological malignancies subjected to autologous or allogeneic-HSCT. Patients with severe cardiac, pulmonary, hepatic, and renal comorbidities. Patients with congenital diseases with iron overload such as congenital hemolytic anemias. Biochemical investigations according to each disease state, which include complete blood picture, liver function tests, renal function tests, iron profile, including transferrin saturation, and necessary investigations to detect iron status. Bone marrow aspiration and trephine evaluation, flow cytometry, and cytogenetic study. Viral markers: HBsAg, HBsAb, HBeAg, HBeAb, HBcIgM and IgG, and HCV-Ab. Cytomegalovirus (CMV) IgM and IgG, HBV PCR, HCV PCR, and CMV PCR as needed. The objective laboratory ‘biomarkers’ included CRP, serum ferritin, serum albumin, and platelet count. CRP and serum ferritin were centrally quantified by enzyme-linked immunosorbent assay technique. Abnormal levels regarding each parameter were investigated. Other investigations according to each disease state include pulmonary function tests, ECG, echocardiography, pelviabdominal ultrasonography, and Doppler study, and full CT scan. Single rooms with positive high efficiency particulate air (HEPA)-filtered laminar air flow are available in the transplant units, and air quality is monitored monthly. Even though water in the rooms passes through a central filter first, all patients use bottled water for drinking. Only cooked food is allowed, and we used dual-lumen Hickman catheters of size 36, which were inserted under local anesthesia by an expert vascular surgeon. All patients used disposable incentive spirometer every 2 h during waking hours throughout the period of admission. The conditioning regimen started after the end of leukapharesis and continued according to the regimen for each disease − NHL: melphalan (120 mg/kg)+etoposide (1600 mg/m2 D-2) , M M: melphalan (200 mg/m2 in D-2) , and AML: fludrabine (D-6 to D-s3) 30 mg/m2+100 ml dextrose 5% over 1 h daily by pump followed by busulfan 1 mg/kg/6 h (D-6 to D-3) . All patients received prophylactic therapy: antiviral for herpes zoster and herpes simplex after transplantation for the initial 6 months (acyclovir 200 mg twice daily), and antibiotics and antifungals (ciprofloxacin and fluconazole orally) and trimethoprim–sulfamethoxazole twice weekly for Pneumocystis carinii infection . The patients were followed up from D0 till D+90. Early detection of the complications and any associated comorbidities was done by history and physical examination and biochemical investigations according to each disease state, and any complications after transplant, recurrence of disease, as well as graft failure, graft-versus-host disease (GvHD), nonrelapse mortality (NRM), TRM, and OS were also recorded. Complete blood count daily, complete chemistry including liver and kidney functions, serum lactate dehydrogenase, prothrombin time, international normalized ratio, partial thromboplastin time three times per week, CMV PCR weekly, and cyclosporine level three times per week. Bone marrow aspirate, trephine biopsy, flow cytometry, radiological study including CT scans, MRI, and skeletal survey, according to disease state. Serum protein electrophoresis, immunofixation, and β2 microglobulin as indicated. The collected data were revised, coded, tabulated, and introduced to a PC using statistical package for social sciences (SPSS 15.0.1 for windows, 2001; SPSS Inc, Chicago, Illinois, USA). Data were presented and suitable analysis was done according to the type of data obtained for each parameter. Mean, SD, and range for parametric numerical data. Frequency and percentage of non-numerical data. Student’s t-test was used to assess the statistical significance of the difference between two study group means. Analysis of variance test was used to assess the statistical significant difference between more than two study group means. Fisher’s exact test was used to examine the relationship between two qualitative variables when the expected count is less than 5 in more than 20% of cells. Kaplan–Meier survival analysis is a descriptive procedure for examining the distribution of time-to-event variables. Additionally, one can compare the distribution by levels of a factor variable or produce separate analyses by levels of a stratification variable. Log rank test was used to compare time-to-event variables by levels of a factor variable. P value of greater than 0.05 was considered nonsignificant. P value of less than 0.05 was considered significant. P value of less than 0.01 was considered highly significant. Overall, 93.3% of patients were CMV seropositive and PCR CMV was done, and the remainder being seronegative. According to HSCT-CI, 60% of patients were low risk and 40% were intermediate risk. 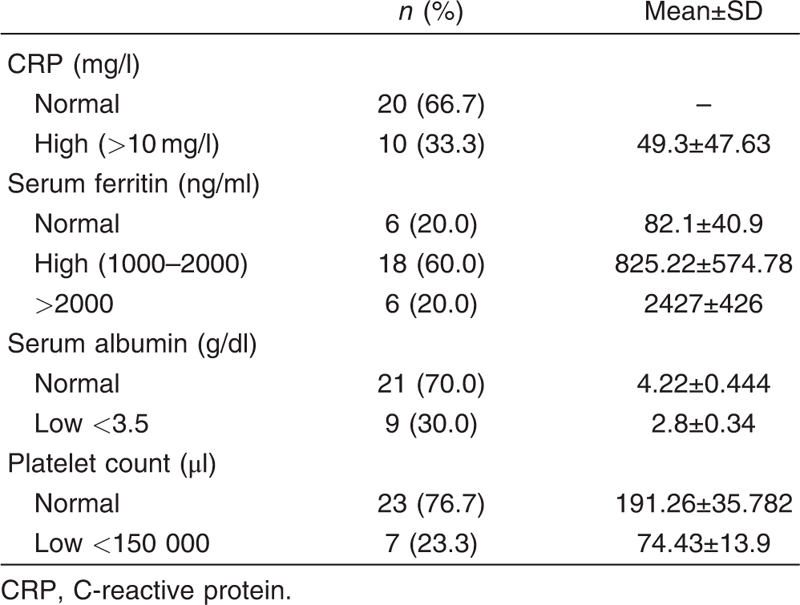 Figure 1 C-reactive protein and ferritin levels in patients. CRP, C-reactive protein. 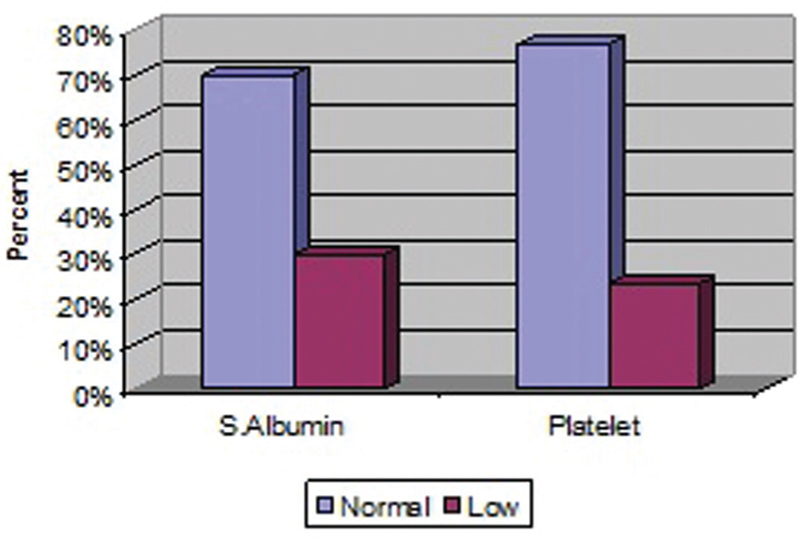 Figure 2 Serum albumin and platelet count levels in patients. 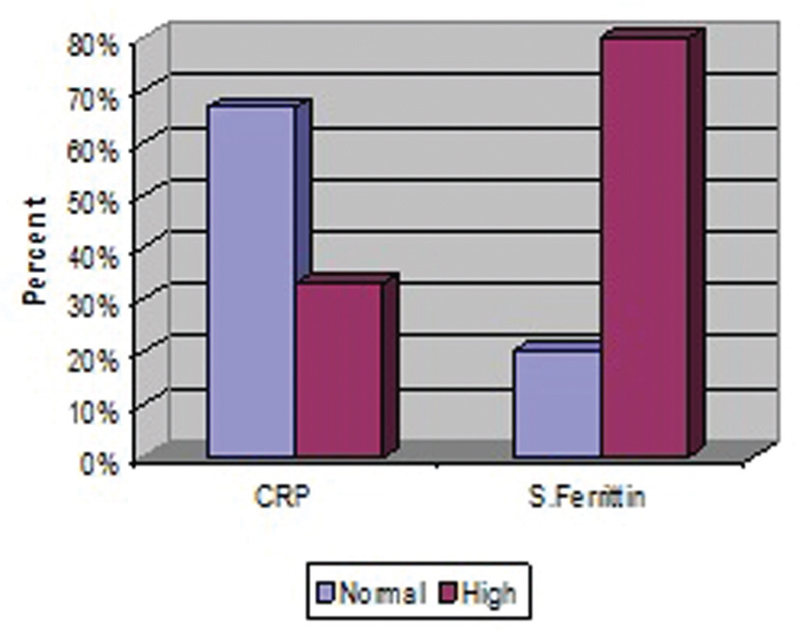 High CRP level was seen in 33.3% of patients owing to inflammation secondary to disease status; serum ferritin level was high in 80% of patients, as they had high iron stores and iron overload; serum albumin level was low in 30% of patients (related to poor nutrition in seven cases and secondary to HCV infection in two cases), and the platelet count was low owing to chemotherapy, causing bone marrow suppression in five cases and secondary to HCV infection in two cases. Acute gastrointestinal GvHD developed in 50% of patients postallogeneic-HSCT. Overall, 6.7% developed hepatic complications in form of elevated liver enzymes owing to activation of HCV infection, 26 (86.6%) of patients developed infections despite prophylactic antibiotics and isolation measures, and 20% developed chest infection. Infections were bacterial in 43.3%, bacterial and fungal in 40%, and combined bacterial, viral and fungal in 3.3%. NRM was recorded in five (16.7%) cases. Overall, 13.3% developed septic shock, four cases died from septic shock, and one case from undefined cause. When we calculated logistic regression to study factors affecting occurrence of post-transplant NRM, the low platelet count was the only factor that affected NRM with statistical significant difference (P=0.046). [Table 5],[Table 6],[Table 7],[Table 8],[Table 9] and [Figure 3] show that the 3-month OS among patients was 87%. 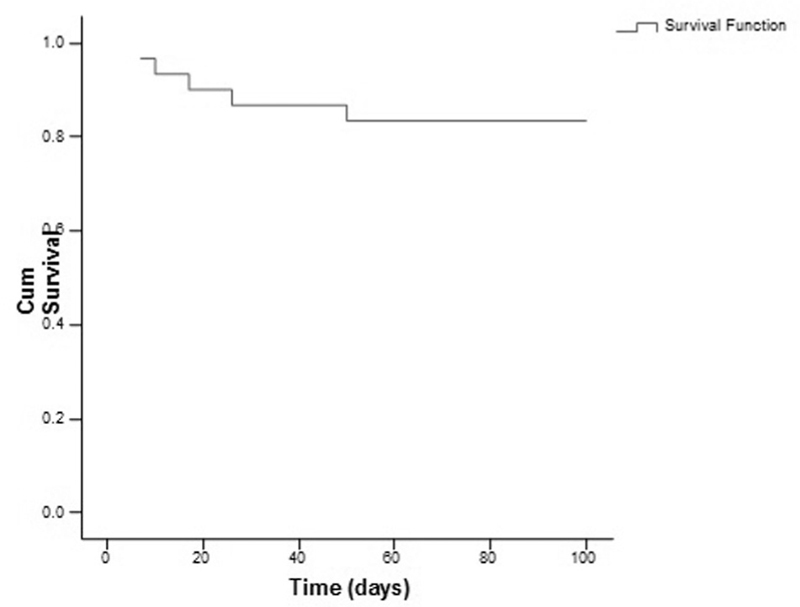 Figure 3 The 3-month overall survival among patients was 87%. The mean survival time in patients with normal CRP was 91.8% and in those with high CRP was 77.4%, with no statistically significant difference (P=0.168). The mean survival time in patients with normal serum ferritin level was 87.667% and in those with high serum ferritin level was 86.883%, with no statistically significant difference (P=0.969). The mean survival time in patients with normal serum albumin level was 85.857% and in those with low serum albumin level was 89.667%, with no statistically significant difference (P=0.647). The mean survival time was 93.9 in patients with normal platelet count and 64.2 in those with low platelet count, with statistically significant difference (P=0.024) ([Table 9] and [Figure 4]). Figure 4 Mean survival time in patients with normal and low platelet counts. Recent studies focused on a number of additional objective laboratory ‘biomarkers’ for pre-HSCT risk assessment. However, various combinations of markers have been studied in different hematological diseases and lines of treatment, with inconsistent results. 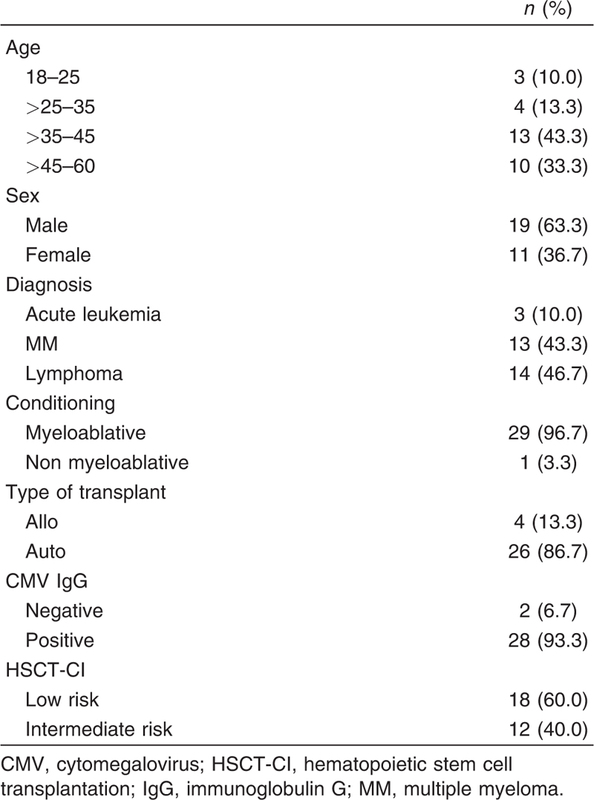 This study included 30 patients with hematological malignancies (19 males and 11 females) with age range of 18–60 years who underwent autologous or allogeneic-HSCT in Bone Marrow Transplantation Units of three different Hematological Centers, in Egypt, to estimate the relation between pretransplant parameters, namely, CRP, ferritin, albumin, platelet count, and HSCT outcome in the first 90 days after transplantation. A total of 26 (86.7%) patients underwent autologous-HSCT to treat high-risk or relapsing NHL, relapsing Hodgkin’s lymphoma, and MM, and four patients underwent allogeneic-HSCT (13.3%) to treat first CR AML and second CR AML. The study population included acute leukemia (10%), lymphoma (46.7%), and MM (43.3%). Totally, 20 patients had normal CRP level and 10 patients had high CRP. Six patients had normal serum ferritin level and 24 patients had high ferritin level. A total of 21 patients had normal serum albumin level and nine patients had low albumin level. A total of 23 patients had normal platelet count and seven patients had low platelet count. We found that NRM was higher in patients with high CRP level than patients with normal CRP, but with no statistically significant difference. A total of 26 (86.7%) patients had post-transplant infections. Overall, 6.7% of patients were CMV seronegative and the remaining were positive, and infection was confirmed by CMV PCR. CMV is a significant cause of serious viral infections in allogeneic-HSCT recipients. Shock developed in 10% of patients with normal CRP level and in 50% of patients with high CRP level, with statistically significant difference (P=0.026), supporting that high-risk patients with high CRP level develop shock. CRP is an acute-phase reactant clinically applied to quantify inflammation and is also prognostic for long-term function and mortality outside of the HSCT setting . CRP is not only a biomarker of inflammation but also seems to be an important component of the innate host defense, and its monomeric form activates and induces proinflammatory cytokine release by endothelial cells. The preconditioning CRP levels probably reflect a proinflammatory phenotype, but it is likely that the complete risk-associated phenotype is more complex involving different molecular mechanisms including immunoregulatory metabolites and cytokines (including interleukin-6 family members) as well as damaged or altered endothelial cells, preconditioning CRP levels function as a risk factor that integrates the proinflammatory effects of several pretransplant characteristics, including serum interleukin-6 levels that showed significant correlation with CRP levels. Statins have been tested to dampen inflammation in those with elevated CRP . Previous analyses correlated pretransplant CRP levels with OS and TRM . Our results are not in agreement with the study by Artz et al. who validated the association of greater TRM with CRP greater than 10 mg/l (P=0.008), and they confirmed that the protocol-specified thresholds of CRP above 10 mg/l predicted for ∼50% greater risks of TRM independent of clinical factors. Tvedt et al. showed that pretransplant CRP had a strong association with TRM at day +100 without significant effect on OS for the whole observation period and suggested that preconditioning CRP is an independent marker for risk of early death in allotransplant recipients with low disease burden. We found that NRM was higher in patients with high serum ferritin level, but with no statistically significant difference (P=0.79). NRM occurred in 16.7% of patients with normal ferritin level and in 22.2% in patients with high ferritin, with no statistically significant difference in any of the patients with ferritin level greater than 2000 ng/ml. Ferritin was high in the four patients with AML who were treated with allogeneic-HSCT; two of them developed aGvHD, and there were no cases with normal ferritin. Our results are in agreement with the results of Artz et al. ; they confirmed that ferritin greater than 2500 ng/ml did not increase risks of TRM or impair survival, and this lack of association of ferritin with outcome contradicts other reports and underscores the critical importance of confirmatory findings. Vaughn et al. had shown that serum ferritin greater than 2500 mg/dl had statistically significant association with NRM, and this result is not in accordance with our results. Other investigators have suggested that high serum ferritin levels may correlate with the effects of acute iron toxicity, and that pre-HSCT transfusion burden  or specific biomarkers measuring circulating free iron may serve as more reliable prognostic variables ,. Previous studies had shown a strong association between elevated pre-HSCT ferritin and increased risk of NRM mortality after allogeneic-HSCT ,,,,. The assertion that this relationship is only owing to the effects of chronic iron overload has been disputed ,,. The notion of high ferritin as merely a measure of high iron stores appears too simplistic as high iron stores by liver iron content do not solely contribute to adverse outcomes ,. Serum ferritin is an acute-phase reactant, and elevated levels suggest iron overload, which has been linked to post-HSCT infections, hepatic, and pulmonary complications . High levels of ferritin, an acute-phase reactant, may indicate the presence of inflammation and occult tissue injury and correlate with the effects of acute iron toxicity, and that of pre-HSCT transfusion burden, therefore specific biomarkers measuring circulating free iron and transferrin saturation may serve as more reliable prognostic variables. Additional studies were suggested to better characterize the physiologic basis of ferritin’s prognostic effect, as it could have significant implications for the incorporation of iron chelation as part of peri-HSCT care ,. Elevated pretransplant ferritin levels have been reported to increase the risk of NRM following HSCT and might influence the risk of acute and chronic GvHD. Iron overload (IO) has been shown to be an important cause of mortality and morbidity in patients who have undergone allogeneic-HSCT ,, which vary from our study results regarding aGvHD, but the number of patients with aGvHD in our study was too small to be interpreted statistically. Regarding serum albumin evaluation, we found that patients with normal albumin level had higher NRM (19%) than those with low albumin (11%) but with no statistically significant difference. Our results are not in accordance with the study published by Artz et al. , and they confirmed that albumin less than 3.5 g/dl predicted ∼50% greater risks of TRM independent of clinical factors, and hypoalbuminemia was strongly associated with inferior survival (P=0.002). Vaughn et al. confirmed also that albumin less than 3.5 and less than 3.0 g/dl had statistically significant associations with NRM. Pre-HSCT hypoalbuminemia may reflect poor nutritional status and poor hepatic synthetic function. Previous studies showed the importance of pre-HSCT nutritional status to OS after HSCT, and they used specific measurement tools such as BMI, bioimpedance, and anthropometry ,. These findings support the inference that the effect of low albumin on outcome is related to nutritional status. As with ferritin, the prognostic value of serum albumin highlights a potential area of intervention (e.g. aggressive nutritional supplementation pre-HSCT) that could be targeted to improve outcome . Serum albumin inversely correlates with age, smoking, obesity, and hypertension; serves as a marker of inflammatory status; and predicts cardiovascular mortality . Albumin crudely estimates nutrition and more broadly reflects the equilibrium between protein synthesis and catabolism. Poor nutrition itself can result from a multitude of factors and organ dysfunctions. Finally, low albumin increases bioavailability of drugs and could increase toxicity . Although albumin is frequently used as a marker of nutritional status or hepatic function, it is also a well-recognized indicator of chronic inflammation, suggesting that its physiologic contribution to prognosis occurs through at least partially separate mechanisms. Regarding platelet count, we found that NRM was higher in patients with low platelet count than in patients with normal platelet count, but with no statistically significant difference. When we studied factors affecting the occurrence of postoperative NRM by using logistic regression analysis, the low platelet count was the only factor that affected NRM with statistically significant difference (P=0.046). Peripheral blood count recovery before HSCT is often used as a marker of poor marrow reserve after prior therapies. Thrombocytopenia, in particular, predicts OS after recovery from induction chemotherapy for AML and after HSCT for MDS, independent of disease or cytogenetic risk. These results may suggest that platelet count has a higher sensitivity to the severity of prior treatment or underlying persistent malignancy, both of which place patients at higher risk of nonrelapse death after HSCT . The mechanisms accounting for the association of low platelet counts and high ferritin and low albumin concentrations in the serum with prognosis after allogeneic-HSCT have not been defined. These laboratory values are readily obtained in the clinic, are easily interpreted, and can be used to provide prognostic information to patients and their families. The 3-month OS among patients was about 87%. Mean survival time was 93.9 days in patients with normal platelet count and 64.2 days in patients with low platelet count, with statistically significant difference (P=0.024). These results come in agreement with Vaughn et al. , who showed that serum ferritin greater than or equal to 2500 mg/dl, albumin 3–3.5 and less than 3 g/dl, and platelet counts of less than 100 000 µl were independently associated with increased risks of NRM and overall mortality after allogeneic-HSCT and could be added to the original HSCT-CI. We found no statistically significant difference regarding CRP and albumin levels with OS, and no statistically significant difference regarding ferritin level and OS. This is in agreement with Shaheen et al. who found no significant statistical difference between the two groups of normal and high ferritin levels in the D100 cumulative survival. We conclude that elevated level of pretransplant CRP and serum ferritin associated with high NRM, without statistically significant difference, whereas NRM was higher in patients with normal serum albumin before transplant, without statistically significant difference, and low platelet count less than 150 000 µl associated with increased NRM, with statistically significant difference (P=0.046); the 3-month OS among patients was about 87%. Mean survival time was 93.9 days in patients with normal platelet count and 64.2 days in patients with low platelet count, with statistically significant difference (P=0.024), not in CRP, ferritin, and albumin. There should be control of any pretransplant inflammation, early treatment of any infection, improvement of the nutrition state of patients, better chemotherapy regimen to improve the platelet count pretransplant, and assessment of complete iron profile, including transferrin saturation together with ferritin to differentiate between iron overload from acute inflammation, which may help in using pretransplant iron chelators to improve post-transplant morbidity and mortality. Vaughn JE, Storer B, Armand P, Raimondi R, Gibson C, Rambaldi A et al. Design and validation of an augmented hematopoietic cell transplantation-comorbidity index comprising pre-transplant ferritin, albumin and platelet count for prediction of outcomes after allogenic transplantation. Biol Blood Marrow Transplant 2015; 21:1418–1424. Kanda J, Mizumoto C, Ichinohe T, Kawabata H, Saito T, Yamashita K et al. Pretransplant serum ferritin and C-reactive protein as predictive factors for early bacterial infection after allogeneic hematopoietic cell transplantation. Bone Marrow Transplant 2011; 46:208. Sorror ML, Estey E. Allogenic hematopoietic cell transplantation for acute myeloid leukemia in older adults. Hematology Am Soc Hematol Educ Program 2014; 2014: 21–33. Otero L, Delgado GL, Argu R. A simplified method for stem cell autografting in multiple myeloma: a single institution experience. Bone Marrow Transplant 2009; 44:715–719. Fanning S, Sweetenham JW. High-dose regimens for autologous stem cell transplantation. Chapter 26. In: Treleaven J, Barrett AJ, editors. Haematopoietic stem cell transplantation. 1st ed. Churchill Livingstone Elsevier: British Library, Printed in China; 2009:67–279. El Zimaity M, Hassan E, El Afify A. Stem cell transplantation in haematological disorders: a developing country experience-impact of cost considerations. Saudi Med J 2008; 29:1484–1489. Reuben DB, Cheh AI, Harris TB et al. Peripheral blood markers of inflammation predict mortality and functional decline in high-functioning community-dwelling older persons. J Am Geriatr Soc 2002; 50:638–644. Lindas R, Tvedt TH, Hatfield KJ et al. Preconditioning serum levels of endothelial cell-derived molecules and the risk of posttransplant complications in patients treated with allogeneic stem cell transplantation. J Transplant 2014; 404:96. Jordan KK, Christensen IJ, Heilmann C et al. Pretransplant C-reactive protein as a prognostic marker in allogeneic stem cell transplantation. Scand J Immunol 2014; 79:206–213. Artz AS, Logan B, Zhu X et al. The prognostic value of serum c-reactive protein, ferritin, and albumin prior to allogenic transplantation for acute myeloid leukemia and myelodysplastic syndromes. Haematologica 2016; 101:1426–1433. Tvedt TH, Stein AL, Reikvam H et al. Pretransplant levels of CRP and interleukin-6 family cytokines: effects on outcome after allogeneic stem cell transplantation. Int J Mol Sci 2016; 17:1823. Alessandrino EP, Della Porta MG, Bacigalupo A et al. 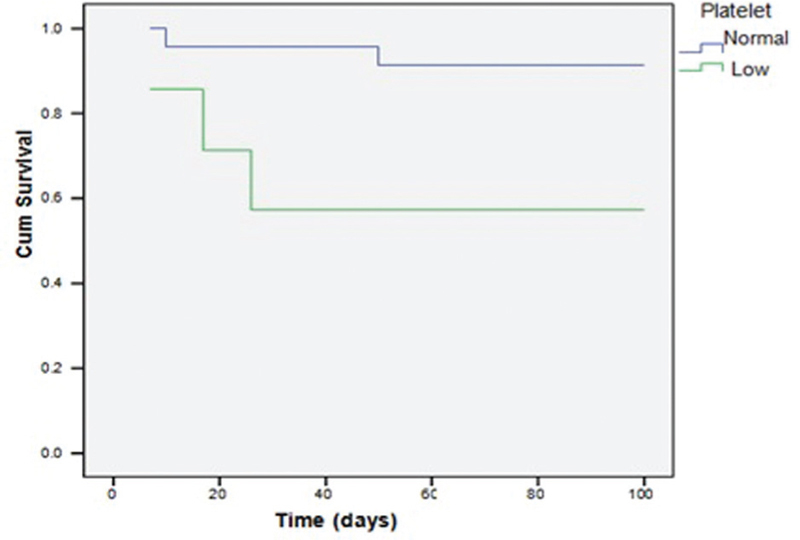 Prognostic impact of pretransplantation transfusion history and secondary iron overload in patients with myelodysplastic syndrome undergoing allogenic stem cell transplantation: a GITMO study. Haematologica 2010; 95:476–484. Armand P, Kim HT, Rhodes J et al. Iron overload in patients with acute leukemia or MDS undergoing myeloablative stem cell transplantation. Biol Blood Marrow Transplant 2011; 17:852–860. Naoum FA, Espósito BP, Ruiz LP et al. Assessment of labile plasma iron in patients who undergo hematopoietic stem cell transplantation. Acta Haematol 2013; 131:222–226. Armand P, Kim HT, Cutler CS et al. Prognostic impact of elevated pretransplantation serum ferritin in patients undergoing myeloablative stem cell transplantation. Blood 2007; 109:4586–4588. Pullarkat V, Blanchard S, Tegtmeier B et al. Iron overload adversely affects survival and increases risk of graft-versus-host disease and blood stream infections after allogenic hematopoietic stem cell transplantation. Blood 2007; 110(Pt 1):875a–876a. Pullarkat V, Blanchard S, Tegtmeier B et al. Iron overload adversely affects outcome of allogenic hematopoietic cell transplantation. Bone Marrow Transplant 2008; 42:799–805. Mahindra A, Sobecks R, Rybicki L et al. Elevated pretransplant serum ferritin is associated with inferior survival following nonmyeloablative allogenic transplantation. Bone Marrow Transplant 2009; 44:767–768. Lim ZY, Ingram W, Brand R et al. Impact of pretransplant comorbidities on alemtuzumab-based reduced-intensity conditioning allogenic hematopoietic HSCT for patients with high-risk myelodysplastic syndrome and AML. Bone Marrow Transplant 2010; 45:633–639. Armand P, Sainvil MM, Kim HT et al. Does iron overload really matter in stem cell transplantation? Am J Hematol 2012; 87:569–572. Wermke M, Schmidt A, Middeke JM et al. MRI-based liver iron content predicts for nonrelapse mortality in MDS and AML patients undergoing allogenic stem cell transplantation. Clin Cancer Res 2012; 18:6460–6468. Virtanen JM, Itala-Remes MA, Remes KJ et al. Prognostic impact of pretransplant iron overload measured with magnetic resonance imaging on severe infections in allogenic stem cell transplantation. Eur J Haematol 2013; 91:85–93. Trottier BJ, Burns LJ, Defor TE et al. Association of iron overload with allogenic hematopoietic cell transplantation outcomes: a prospective cohort study using R2-MRI-measured liver iron content. Blood 2013; 122:1678–1684. Armand P, Kim HT, Virtanen JM et al. Iron overload in allogenic hematopoietic cell transplantation outcome: a meta-analysis. Biol Blood Marrow Transplant 2014; 20:1248–1251. Sivgin S, Baldane S, Ozenmis T et al. The impact of pretransplant hypoalbuminemia on survival in patients with leukemia who underwent allogenic hematopoietic stem cell transplantation (alloHSCT): a nutritional problem? Transplant Proc 2013; 45:3371–3374. Armand P, Sainvil MM, Kim HT et al. Pre-transplantation iron chelation in patients with MDS or acute leukemia and iron overload undergoing myeloablative allo-SCT. Bone Marrow Transplant 2013; 48:146–147. Kim SJ, Choi JM, Kim JE, Cho BK et al. 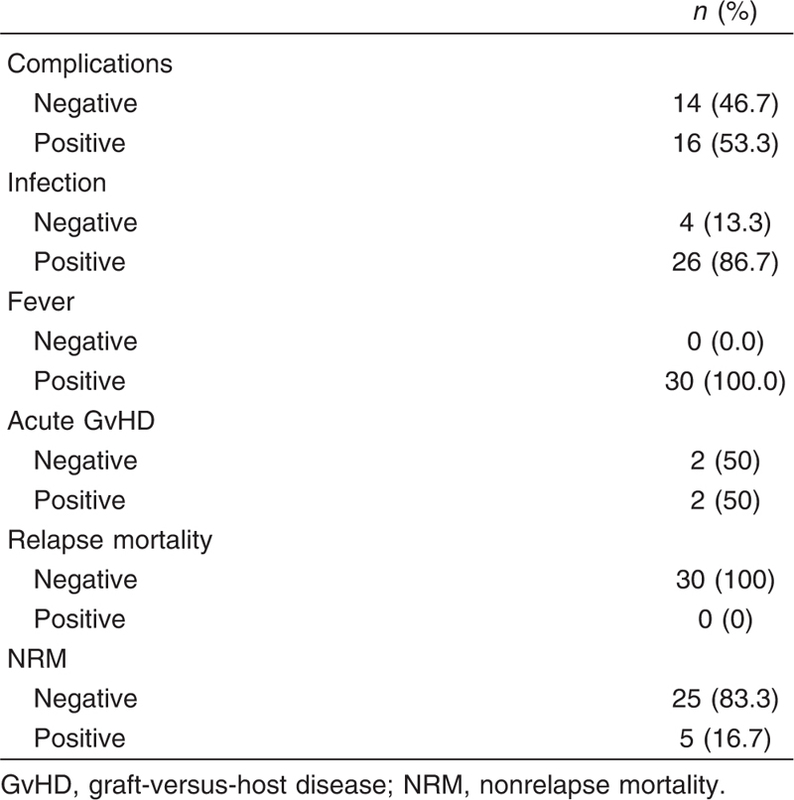 Clinicopathologic characteristics of cutaneous chronic graft-versus-host diseases: a retrospective study in Korean patients. Int J Dermatol 2010; 49:1386–1392. Kataoka K, Nannya Y, Hangaishi A et al. Influence of pretransplantation serum ferritin on nonrelapse mortality after myeloablative and nonmyeloablative allogenic hematopoietic stem cell transplantation. Biol Blood Marrow Transplant 2009; 15:195–204. Hoffmeister PA, Storer BE, Macris PC et al. Relationship of body mass index and arm anthropometry to outcomes after pediatric allogenic hematopoietic cell transplantation for hematologic malignancies. Biol Blood Marrow Transplant 2013; 19:1081–1086. Farias CL, Campos DJ, Bonfin CM et al. Phase angle from BIA as a prognostic and nutritional status tool for children and adolescents undergoing hematopoietic stem cell transplantation. Clin Nutr 2013; 32:420–425. Shaheen M, Ivanova M, Moiseev I, Ivan S, Sergey V, Bondarchuk, Boris V et al. Impact of initial serum ferritin on early post-HSCT complications: a single-center study. Cell Therapy Transplant 2015; 5:40–49.